As a pure golf destination, Michigan has it all. From coast to sparkling coast, The Wolverine State features a collection of courses that belong on any list of Midwest Golf Royalty. While the north and western portions of the state get most of the accolades, there is a destination so centrally located that it might get lost amongst its more famous brethren. After a postcard perfect, three-day trip in late July, it is evident the courses located in Central Michigan are affordable, wildly entertaining, and stunningly beautiful. Plus, the region has a powerful golf ally: Mount Pleasant’s Convention and Visitor’s Bureau created the Central Michigan Golf Swing as a way to tie in their top courses and lodging establishments. MGM was fortunate to take a few swings on The Swing and recount the highlights. Dan Pohl is a Michigan golf legend who has only cemented his status by coming home. The Mount Pleasant native was a professional golfer for 34 years and his career highlights included a runner-up finish at the 1982 Masters, two TOUR Wins, and a Ryder Cup Appearance in 1987. But the 63-year-old Pohl is just as proud of the legacy he’ll leave behind thanks to Pohlcat, a dramatic course that pays homage to his nickname. Pohlcat is the definition of a community golf course, as the property includes a phenomenal restaurant and banquet facility, plus The Golf Garage, a memorabilia-laden space that gives Pohl the chance to mentor youth interested in his career path. “For me to come back and try to help local golfers evolve has been amazing. I love being able to share my experiences and let them know what they need to do now if they have aspirations of being a professional golfer,” ended Pohl. The 1981 PGA Tour leader in driving distance (280.1 yards with a permission-headed driver) was a fader off the tee so expect a few subtle dogleg rights to match his ball flight. My personal favorites at Pohlcat include the par-4 2nd which plays 377 yards from the white tees to a tucked green surrounded by trees and a small water hazard 50 yards in front of the putting surface. The 6th hole is a drivable par-4 with a good level of risk/ reward thanks to a towering oak tree perfectly positioned 50 yards short and right of the green. Pohlcat’s inward nine features a collection of playable holes that start in an open field and conclude by taking you into the heart of north woods Michigan. In fact, Pohlcat’s trio of 15 through 17 gets an unofficial Editor’s Choice Award as my favorite new triumvirate. Number 15 is a risk/reward short par-4 tucked in the forest, while 16 might be the most mind-bending 455- yard par-5 I’ve ever experienced. I played it twice and made a well-earned par the second time by hitting 5-iron, 6-iron, gap wedge in succession. Finally, the par-3 17th plays over a ravine to a diabolical green tucked into a hillside. This is a penultimate hole for the ages! Twelve years can seem like an eternity in golf years. I was a rookie at MGM when I experienced Bucks Run for my one and only time. And my, has this Jerry Matthews 6,914-yard, par-72 masterpiece matured in all the right places. 290 acres of wooded sections combine with natural wetlands to elicit a serene golf experience from start to finish. Throw in a few holes surrounding The Chippewa River and you’ll understand why Bucks Run is part sanctuary, part golf heaven. Jon Conklin, Bucks Run’s Director of Operations and Head Golf Professional, offers his take on what makes the property so distinctive. “From start to finish this course makes you feel like you’re up north but you’re really in Central Michigan. When you ask about naturalness, I think of what Jerry Mathews told me when I first started back in 2009. He said that he’s ecstatic that he did not have to move much land to make the course what it is. The natural beauty, mixed with the lakes, river, and wetlands showed the true beauty,” explained Conklin. 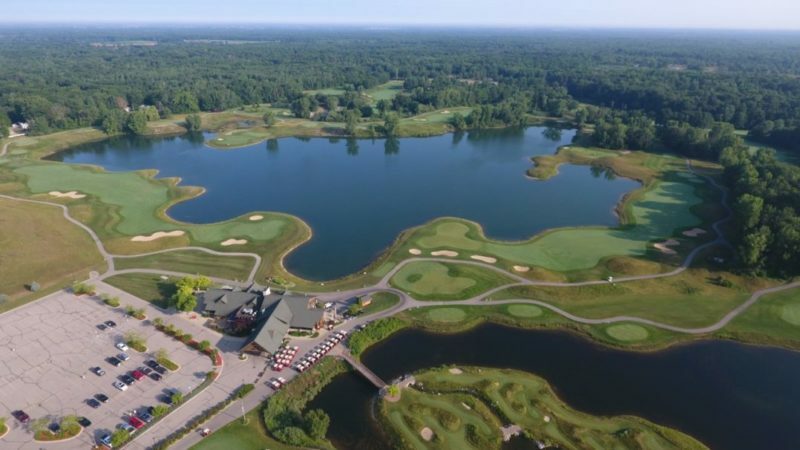 Bucks Run creates an all-day golf experience thanks to its top-tier amenities including an 18-hole Putting Course in the middle of Fisher Lake. The real-grass facility actually uses goats to cut down the fescue grass in the most natural way possible. I believe their $88 to $98 green fee during peak time is one of the best values in the Midwest, as everything about Bucks Run screams upper-eulachon property. For more information on Bucks Run, make sure to visit their website at www.bucksrun.com. When in the Mount Pleasant area, MGM recommends staying at the nearby Soaring Eagle Casino and Resort, which is ideally located between both properties. Soaring Eagle is known as the entertainment capital of Central Michigan, thanks to a bevy of national music and comedy acts they book at their 15,000-seat theater year round. To learn more about the casino resort, visit www.soaringeaglecasino.com. On the same trip in 2006 I was introduced to St. Ives and Tullymore Golf Clubs, two dynamic courses located in Stanwood, roughly 45 minutes west of Mount Pleasant. Twelve years ago Tullymore was still in its infancy stage, as the Jim Engh design opened to the public in 2002. Golf Digest’s number one new Upscale Public Course in America was in the middle of nowhere, with a double-wide trailer serving as their clubhouse and a cute, one-room halfway house greeted players while making the turn. While the halfway house dubbed “Tully’s” still remains, everything else has changed – in an amazing way. Now Tullymore Golf Club has been transformed into Tullymore Golf Resort, complete with an incredible clubhouse, multiple small and large group lodging options and residential subdivision known as “The Villages of Tullymore.” The course hosted a LPGA Symetra Tour event from 2015-17 and consistently ranks as one of the top 100 Public and Resort Courses in the Nation. Simply stated, if you want to feel like you are in northwoods Michigan without the extra 2 ½ hour drive then you have to head to Tullymore and St. Ives. “Being located in Central Michigan certainly has its advantages, but not necessarily in relation to Northern Michigan resorts,” began Martin Mohnke, Tullymore Resort’s Director of Sales & Lodging. “At Tullymore Golf Resort, we boast the highest rated combination of golf courses in the state with Tullymore and St. Ives Golf Clubs, offering superior playing conditions as well as excellent accommodations and service. We feel we take it a step farther by providing amenities usually associated with the high-end resorts on the east and west coast of the country, but at a value unattainable in Michigan,” ended Mohnke. Both properties truly cater to golf groups of any size, as the newly created Lodge at Tullymore sleeps up to 24 in a private retreat complete with a pool, putting green, and bocce ball court. Their four Custom Cottages each have four bedrooms and four-and-half baths and can be rented throughout the year. Finally, our group had the privilege of staying in The Residence Club, a collection of three and four bedroom units that overlook Tullymore’s famous 18th hole. I recommend checking out their website at www.tullymoregolf.com to find the best lodging option for your group. In summary, golf in Michigan never ceases to amaze, as the entire state is loaded with top-flight destinations. The most underrated one makes travel time a breeze thanks to its central location. For more knowledge on all that this emerging region has to offer, visit www.mountpleasantwow.com or www.michigan.org. If you live in either Wisconsin or Michigan there is a golfer-friendly amenity that makes traveling easy. Since 2004 The Lake Express High Speed Ferry is the perfect way to start and end your trip and allows your group to never deal with the Orange Barrel Zone otherwise known as Chicago. Depending upon where you travel to after you debark in either Milwaukee or Muskegon, your overall drive time can be cut in half.